Historians are always interested in reading skillfully collected sources from the past. 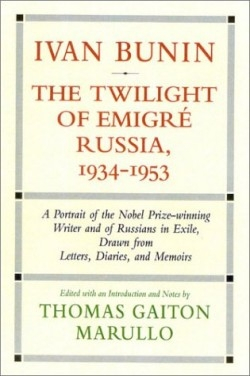 For this reason, the editor, professor of Russian literature and culture from the University of Notre Dame, should be commended for this book, a collection of extractions from various documents. Marullo covers approximately twenty years of the life of the seminal Russian author and Nobel Prize laureate, while he was in France before, during, and after World War II. The documents provide a picture, not just of Bunin’s life, but the lives of his fellow émigrés as well, and the Soviet authorities’ approach to Russians living abroad. The most interesting collection of documents dealt with the years of World War II. The majority of Russian émigrés were bitterly anti-Soviet and viewed the Soviet regime as a tragedy that had befallen Russia. Some of them hated the regime with such intensity they were ready to support the Nazis in their war against USSR/Russia. Others, such as Bunin, held much more complex feelings, which changed over the course of the war. At the very beginning, Bunin, judging by the documents presented, saw Hitler’s invasions as a just punishment for Bolshevik crime. Yet, as the war progressed and Nazi troops penetrated deeply onto Russian soil, his attitude changed. From that point on he saw the country that he loved, not the regime, in danger. He started to view Stalin not as a Soviet leader but a Russian statesman who saved the country from a mortal threat. Bunin’s position in the immediate post-World War II era was also different from that of other émigrés. Many of them were elated by Russia’s victory in the war and by the country’s transformation into a superpower. This use of Soviet patriotism, this peculiar form of “National Bolshevism,” was completely foreign to Bunin and his hatred of the regime returned. The book also explains the attitude of Soviet officials towards the émigré community. While the official Soviet publications vilified the émigrés and celebrated their suffering abroad, Soviet representatives wooed some important intellectuals back to Russia. This was the case with Bunin, who was promised a lavish lifestyle and publication for his works. Besides information about the political stance of Russian émigrés in general and Bunin in particular, the reader will find interesting stories about Bunin’s personal life (his love affairs and pervasive fear of death) as well as his views on literature. This book would be of greatest interest to those specializing in Russian culture and literature, especially for those already having a fairly good grasp of the subject.